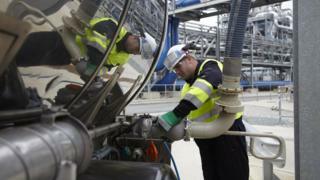 The UK's biggest bioethanol producer has announced it is to stop production for the second time at its East Yorkshire plant. Vivergo Fuels, which employs 150 people in Hull and Hessle, plans to cease production at the end of September. The company currently buys over one million tonnes of wheat from farms in Yorkshire and North Lincolnshire, which it said supports about 3,000 jobs. It also supplies animal feed, which is a by-product of making bioethanol. Vivergo said a difficult trading environment and further delays in legislation to make oil companies use more bioethanol in petrol were to blame. The company - part of Associated British Foods - said it had invested heavily in its Hull plant in the expectation ministers would introduce new rules. The plant first ceased production in December but started again in April in the hope conditions would improve. Managing director Mark Chesworth said: "I am extremely disappointed at having to make this difficult choice. "But sadly, the government's lack of pace over the past decade to introduce E10 [making oil companies use 10% bioethanol in petrol] has further undermined our ability to operate. "My employees are my number one concern at this time and we have entered into consultation with them." Speaking on the impact on agriculture, arable farmer Keith Wells said: "We've got to look at where this wheat is going to go now, we have lost one of our main markets." Dairy farmer Paul Tompkins, who buys feed from the company, added that after the dry summer and so-called Beast from the East this was now another additional cost he would "struggle to take". The Department for Transport said it was "committed to supporting the biofuels industry" and was currently consulting on how "we could introduce E10 fuel to UK forecourts".